There's a parking lot at the corner of Washington and Union in Pico Union. By day it's an unassuming parking lot, sometimes filled with cars sometimes not. Mostly not. 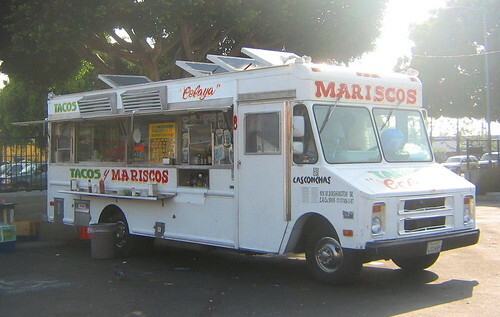 Come twilight(sometimes earliar) a taco truck named Tacos Celaya rolls in serving mariscos and tacos to locals and all comers. I first noticed her driving west out of downtown. The words mariscos painted across the front of the truck next to words Tacos Celaya. Celaya is a city from the state of Guanajuato in the central highlands of Mexico. 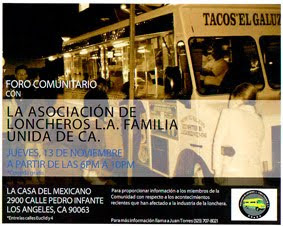 Authentic tacos from the city of Celaya? I've never been to Celaya so I can't be the judge . But what I can judge is how these tacos compare to the local competition(king taco, el taurino) and they compare quite favorably. The al pastor is cut right from the spit. The pork, moist and sweet in the middle , charred at the tips. The asada, greasy but oh so good, the right amount of spice and charred bits in every bite. . Both tacos topped with onions, cilantro and a salsa roja with a squeeze bottle of roja available for those that like an extra kick in their tacos. 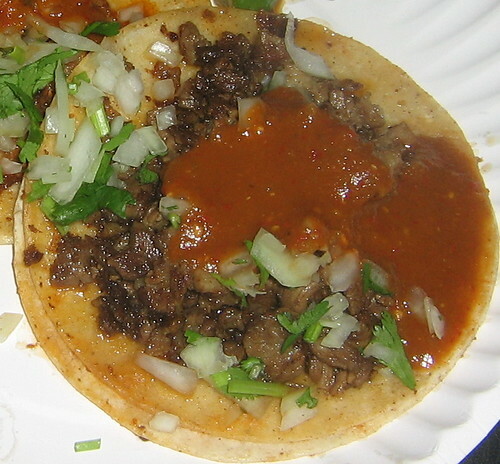 Everything is done well, no gristle on either taco, the tortillas are oiled perfectly, the salsa spicy and flavorful. Not only do they serve up excellent tacos but the mariscos and shrimp cocktails looked every bit as good. So my friends,if you travel along Washington blvd in Pico Union you've probably seen this truck and wondered. Wonder no more , this is a truck worthy of pulling over for. damn, I passed that truck last month! But I won't pass it up next time! Im a fellow westside girl looking for a delicious and authentic al pastor taco seared on a spit with the pineapple on top! the kind where your taco is topped off with a slice of grilled pineapple. where are they? are there any yhe westside? 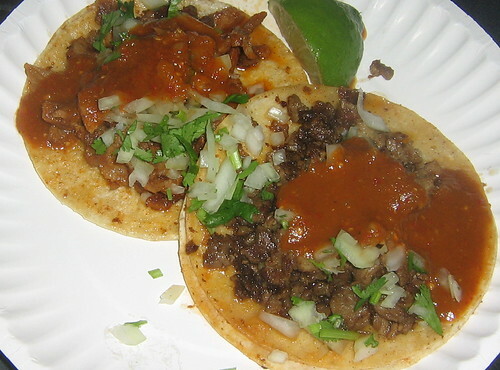 There are a couple of al pastor spits on the westside though. Pili's tacos on santa monica blvd has an al pastor spit on the weekends. did they change it? i think it's Tacos El Ostion. Food and prices are the same as what you have posted.